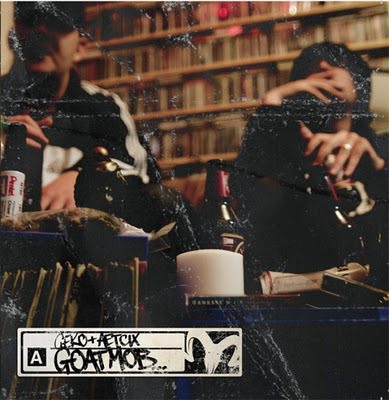 Both being heavily involved in Melbourne’s underground hip hop scene, Geko & Aetcix have teamed up together to create this album under the name GOATMOB. This is a new collaboration which sees the two Crate Cartel members sharing their talents, both production wise and lyrically, bringing some raw, heavy beats and rhymes. Geko & Aetcix contribute equally to the production process, especially in their unique brand of downbeat, bass-heavy beats matched with lyrically aggressive and unconventional rhyme structures. This is particularly evident in the track French Revolution which sees Geko rhyming in a very laid back laconic style, often rapping without rhymes to create an unconventional structure. Who’s That possesses a very different vibe in comparison and is probably the most polished and structured song on the album production wise. While the lyrics are delivered in a very rugged and aggressive manner, the beat is clean and well-produced, containing a strong amount of guitar licks, over heavy drum loops. As far as guests go, there are the usually suspects you’d expect from the Melboune hip hop scene including Maundz, 1/6, Fluent Form and Fatty Phew. It’s Maundz that steals the show with his track CC Camorra, providing the best verse on the album over a Premo-esque keyboard loop. It’s this sort of loose, jazz-inspired sound that Maundz excels at, rhyming effortlessly with such a distinctive flow. 1/6 also contributes a brilliant verse on the track Mob, which shows the interesting contrast between him and the other two MCs. While Geko & Aetcix both rap in their typical slow-paced, aggressive flows, 1/6 provides an opposing style of rapid delivery in a very relaxed and effortless fashion. Other guests on the album include Geelong’s Fatty Phew who lends his vocals to the track Nothin’, putting his own spin on the track with his distinctive deep voice and clever punches. The music GOATMOB produce is for those who like their hip hop with plenty of bars. This will appeal to fans of Lyrical Commission, Kings Konected, Crate Cartel and other crews that bring nothing but lyrical heat, and enormous amounts of depths in their verses. You may also want to have a peek at these reviews: Maundz, Illy, Nas.